Hello there are you enjoying your weekend? I have been working today and then packed for my class tomorrow so I am here blogging before jumping into a hot bath and my pj's. I am sharing a few sweet treats I made for my clubs this month and the sweet treats I made as my swaps at last Sunday training event. First my lovely customers that order from me every month each got one of these. I love our sweet treat cups they are so versatile and so very cheap. Perfect for so many occasions I had to make up 50 of this babies and by the time I finished I run out of jelly beans( well I didn't run out I have tons left in purple green yellow and orange but they didn't suit the colour scheme LOL) so had to run to my local shop and buy some Skittles. 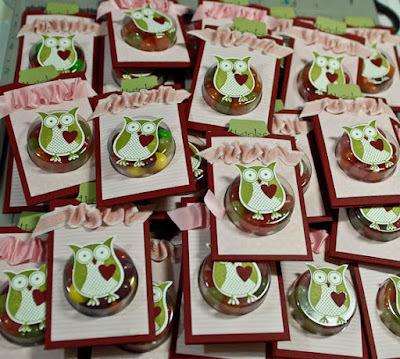 The members also received a step by step video tutorial of how to make this cute treat holder. I have used Cherry Cobbler card stock Blushing bride designer paper and Old Olive ink. Blushing bride luscious ribbon and the PUNCH BUNCH stamp set. I have a new Virtual Club starting in March and there are 8 places left. 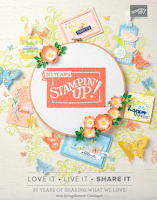 How would you like to get a little product every month delivered straight to your door, receive fabulous freebies in the month you are the hostess, receive a free catalogue, receive treats and samples of products from myself and enjoy FREE and exclusive video tutorials straight to your inbox every month? if this sounds good and you are interested in taking a place or even two then please let me know and I will add your name to the list. You can read more about it HERE . I have to say they took longer than my treat holders believe it or not simply because I had a lot of hand cutting, my hand did hurt by the time I finished but thank God for our new big craft scissors so much easier for cutting bigger areas than the much loved snips. I bought those lovely heart shaped chocs in my local COOP and I knew I wanted to use them on my swaps. The sweetheart stamp set came in handy and it was at the point of having to cut them all out that I realised how much I love punches LOL. 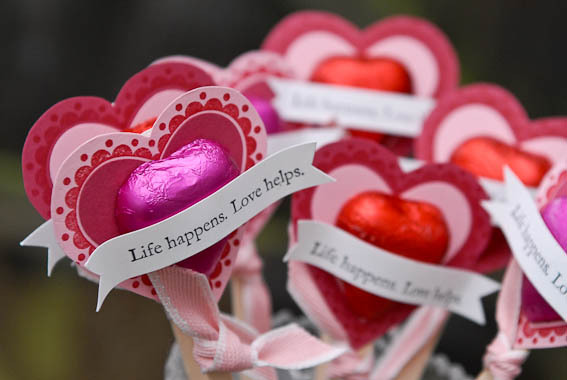 I did use the big heart punch to add a contrasting piece of card inside the frame them simply stuck the chocs on top. 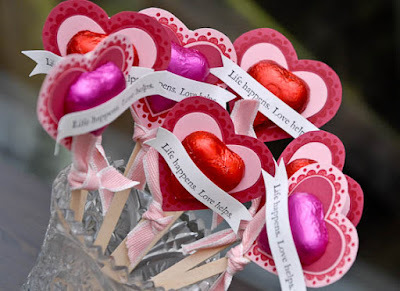 I then glued this to some tall coffee stirrers, tied some ribbon at the base of the hearts, stamped and curled a sentiment from the Vintage Vogue set and I was done. Colour wise I used a mixtures of pinks and reds. The pink hearts had Blushing Bride and Rose Red card stock and the red foiled hearts had Rose Red and Blushing bride card. I had stamped both colours with Real Red ink. Right I have a hot bath calling me and an early night as I am teaching this tomorrow morning, and then I am stamping with my team in the afternoon, woohooo. Have a great Sunday see you on Monday with some belated birthday wishes for some Passionettes. These are adorable Monica!! Anyway that you will share the instructions with us!! wowzer! what beautiful projects!! 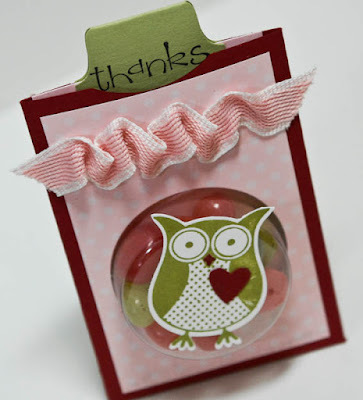 I adore the treat cup owls. Clever you!! Absolutely ADORABLE (just like you) - I smiled when I read you went to COOP and it made me homesick! 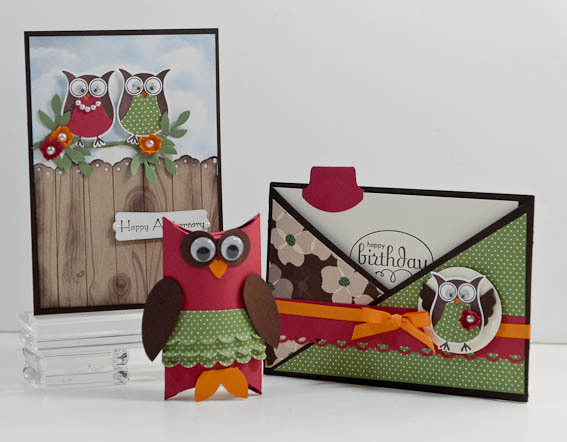 I love the owls - they are soooooo my favourite thing the Mini catalogue will have. I've left you a little something on my Blog. Gorgeous swaps! Really love the hearts! Fabtastic!! Just gorgeous, and so is your blog. Thanx for sharing. Oh wow these are adorable!! !